To skip straight to the tutorial, click here. I would like to regularly feature tutorials and share patterns with you. Also I will frequently be sharing my works in progress and other crafty happenings. I would love to hear from fellow sewing enthusiasts. Feel free to get in touch with me and if you have a craft blog share your link so I can stop by for a visit! Quilting and tea go hand in hand...for me. I always have a cuppa while I'm sewing. Thus, my idea for a wall clock of sorts for my craft room. Like a good pot of tea, I'm sharing it with you. Special thanks to Fluffy Sheep Quilting for the fabric. I've had this idea in mind for some months now. I sketched it out and had great fun bringing it to life. Do you sketch out your ideas? Originally, I was thinking of making this with a working clock mechanism - which you should be able to find at your local craft store. As I was working with a budget and a deadline, I decided against it. I am quite happy with the result. Though, the working clock idea is still in the back of my mind. You see, my craft room does not have a clock and needs one. Hmmm....another project for another day. Now, with my new wall hanging, in my craft room it is always tea time. I always begin by putting the kettle on so that I have a nice hot cuppa tea to drink while I’m working on my projects. While the kettle is boiling, I find that this is a good time to do the necessary ironing. Ironing is not a favorite chore of mine. Unless I’m ironing fabric, then it’s fun and not work. Cut out the paper templates. Use paper cutting scissors - please do not use your fabric scissors. Next, cut out the fabric and interfacing. I used these fabrics for my teacups. I fussy cut (cut around the shape of the design, in the fabric) each of my teacups. This beautiful Serenade collection brought teacups to mind immediately, as it reminded me of fine china. Place the teacup templates on the design you want to feature on your teacups. I chose to cut the Purple Peacock fabric so that the lines were horizontal on my teacup. For the teapot, I pieced my teapot together with fabric showcased in each teacup to give it a patchwork look. I did this by dividing the pot part of the teapot into four 2 inch squares. I mixed up the four fabrics to get a patchwork look for my teapot: Rabble of Butterflies, Purple Peacock, Purple Filigree, Orange Filigree. I also chose a fabric for the spout, lid, and handle. Lastly, cut out your clock hands (four - front and back with interface inbetween) from the black fabric(x4) and interfacing(x2). Place teacups on interfacing and cut out. Be sure to cut out the inside of the handle. Do the same for the teapot and the clock hands. Before pinning the teapot, teacups, and clock hands, lay your background fabric the long way (22 inches wide). Find the center of the fabric and pin teapot with interfacing behind it to the center of the background fabric (see left). Arrange the teacups around the teapot like you are looking at a clock. Pin teacups with interfacing (on wrong-side of fabric) to background fabric at 12 o’clock, 3 o’clock, 6 o’clock, and 9 o’clock. Just for fun, I tilted my teapot so that it looks like it is pouring tea into the 6 o’clock teacup. Don’t forget the clock hands. Tack down at center of teapot. Sew button on top of the ends (non-arrow end) with black thread. I say, “toe-may-toe”. You say, “to-mah-to”. Batting and wadding are one in the same. I’m American, it’s “batting” to me. To Australians, it’s “wadding”. I recommend using a low loft batting/wadding. Lay your backing fabric on the batting/wadding and cut out a fat quarter size (18” x 22” - see right). Now, make a sandwich: backing + batting/wadding + background w/teacups = “Tea Time”. Pin the sandwich together - the three layers: backing + batting/wadding + background w/teacups. Quilt as desired. 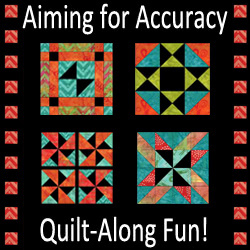 Personally, I find hand quilting very relaxing. Yet, if I’m in a hurry, I turn to my Elna. For this project, I chose to hand sew around each teacup and the teapot and each loop. Using the remaining fabric from the teacups, cut strips 2 inches x width of fabric. Alternate the strips from the four fabrics and sew together end to end, giving you a very long 2 inch strip. Fold in half and use your iron to press. Fold the top half to the pressed line in the center. Fold the bottom half to the pressed line in the center. Now you have binding for your quilt. Pin in place to the front side of wall hanging (wrong-sides together) and sew with machine. Next, fold down the binding to the back side of the wall-hanging (right-sides together), pin and sew by hand. Finished! Pour yourself a cuppa. It’s definitely tea time. You deserve it. 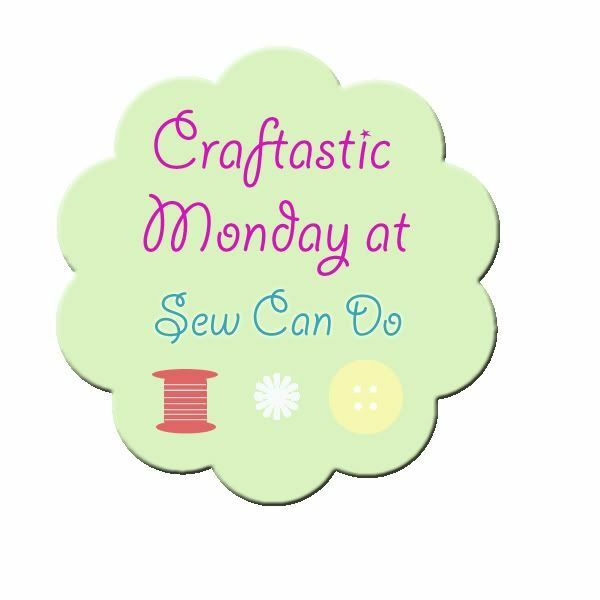 I'm linking up with Sew Can Do for Craftastic Monday. 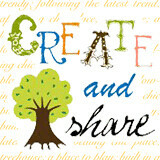 and The Trendy Treehouse for Create and Share. and Sugar Bee Crafts for Take A Look Tuesday.